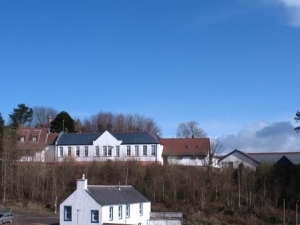 Complete Mechanical and electrical services within existing combined Tobermory High and Primary School. The two buildings were complexed in that they had been constructed at various stages and various levels thus creating a challenge in the horizontal communication of services. Hawthorne Boyle acted as Contract Administrators on behalf of Argyll & Bute Council. Application for Building Warrant, and subsequent sign of building completion certificate and final account sign off. Installation of a new wet heating system throughout and hot and cold water system which were supported by two new buffer vessels, which in the interim would be electrical but ultimately supported by a Biomass Plant. New Analogue Addressable Fire Alarm System.